Porsche is exploring new ways to engage with customers through live experiential events, including theming events around food, music and sport. 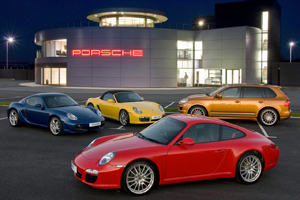 The automotive firm has already launched a number of new customer events since opening its Porsche Experience Centre at Silverstone in 2008, including one-to-one driver safety, and core and advanced driver-skills training, as well as bespoke driving programmes for team-building. However Porsche Experience Centre manager James Taylor told delegates at C&IT's Agency Forum today that the brand is to pilot a food-themed event from October, which will see existing and potential customers invited to enjoy an evening of Michelin-starred food from chefs such as John Campbell, and music. "There is no driving whatsoever, it's just bringing together a group of people who are interested in food and getting them to think positively about the Porsche brand. The initial reaction has been good, and if it works, we'll try and do an event once a month," said Taylor. Porsche also has a Sports Science Lab at the Experience Centre, which has it enabled it to offer events around human performance testing for customers and clients. "We had the Sheffield United football team down here for a 'sweat test' a couple of weeks ago, which made it onto Sky news and also gave us access to a completely different audience, many of whom were potential Porsche customers," said Taylor.